The A-plot of this week’s The Flash, titled “Memorabilia,” was part Inception and part Eternal Sunshine of the Spotless Mind. Barry (Grant Gustin) planned to reach Cicada (Chris Klein) by waking his niece up, but instead wound up rescuing Nora (Jessica Parker Kennedy) from her tainted memories and re-evaluating her relationship with Iris (Candice Patton) in the process. That section alone could have been the entire episode, as it refocused on the emotional drive of the show and recentered the Flash family after two less-than-stellar hours since the return from hiatus. 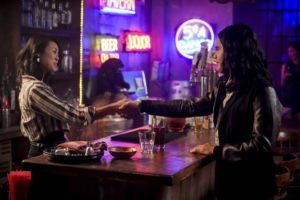 In addition, the metahuman cure storyline inched forward as Cisco (Carlos Valdes) discovered a missing component for his science project in addition to a possible new romance thanks to Ralph’s (Hartley Sawyer) well-intentioned machinations. The mind plays tricks on the West-Allens. 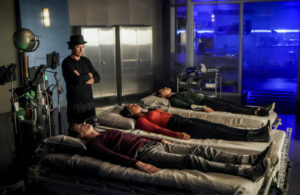 The reason behind Nora’s bitterness towards Iris at the start of the season took a backseat once the girls decided to mend fences in “All Doll’d Up,” but it returned to the forefront of the proceedings in “Memorabilia.” Due to her own secret – in the form of a friendship with Eobard Thawne, no less – Nora felt the need to enter Grace’s mind alone to ensure that her father would not be privy to her own memories. This led to her being trapped in the young girl’s filtered memories of the happy times she spent with Orlin before the accident, which appeared to be part of Sherloque’s (Tom Cavanagh) big-picture scheme to uncover her secret. Over the course of the episode, Nora realized that Grace was not only papering over her home life out of love for her uncle but also harboring a deep resentment towards metahumans for the death of her parents and towards The Flash in particular for trying to stop Orlin’s mission. Actress Islie Hirvonen should be commended for her performance here, because she managed to make little Grace’s wrath more terrifying than Cicada’s has been all season – to the point that I wouldn’t be surprised if she became the Cicada of 2024, stacking up a kill count in the hundreds and tarnishing The Flash’s legacy after his disappearance. Speaking of Barry’s legacy, that was where the heart of “Memorabilia” lay: in the Flash Museum (which was previously STAR Labs, fully embracing its sole purpose of exposition) where little Nora constructed the fantasy of Bad Mother Iris West-Allen. For the first time since she had heard the horror stories, Iris was confronted with a vision of her future self yelling at her daughter and breaking her toy in an effort to tear her away from the faint memory of her father. To be fair, even the scene as presented did not justify calling Iris a terrible parent, seeing as how Nora had run away from home and worried her mother sick. But it was harsh enough for her to fear that the future was coming to pass whether she liked it or not, a factor that had also been preventing her from moving forward with the creation of her own newspaper. The Central City Citizen, in her mind, cemented Barry’s disappearance and her own strained relationship with her daughter, which was something she and Barry tried to grapple with in a series of beautiful and bittersweet scenes inside of Nora’s mind. mother still mourning the love of her life but trying to hold it together for their child. She was assuaged enough to move forward with the Citizen, pushing the foundation date up by two years (and in doing so possibly also foreshadowing the earlier-than-anticipated Crisis on Infinite Earths). The final moment of understanding between her and Nora was their best to date, with both Patton and Parker Kennedy giving one of their best performances of the season. Cisco and Ralph had a much lighter subplot in the meantime, but one that nevertheless emphasized the importance of human connections in The Flash. Continuing his world tour of relationship counseling and general do-gooing, Ralph purposely tricked Cisco into a night on the town so that he could stop obsessing over the cure and start getting back out there. While at first angry at the misdirection and stymied by his own mental block, Cisco quickly met a lovely photographer-slash-bartender named Kamilla Huang (played by the adorable Victoria Park) and figured out that he needs a control subject for his experiment. Ralph has more than earned his Most Improved award, and I’m very much looking forward to seeing where Cisco’s romance takes him as well as hoping that Kamilla will land herself a job with Iris. If there’s one thing The Flash can never have too much of, it’s women actually talking to each other.